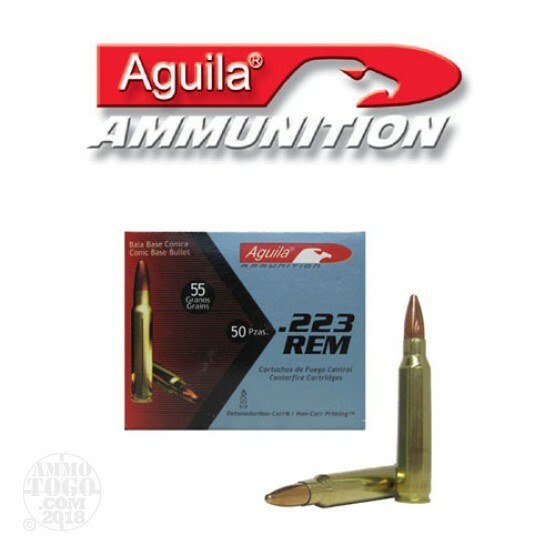 This is Aguila .223 55gr. Full Metal Jacket Ammo. This ammo is brass cased, boxer primed and 100% non-corrosive. This ammo is manufactured by Tecnos Industrias, which is Remingtons plant in Mexico, and is premium quality ammo. They are the exclusive manufacturers of ammo for the mexican military and police forces. Remington built this factory in Mexico years ago and they continue to produce quality ammo. This ammo is manufactured to military and SAAMI specs. It is packed in 50rd. boxes. Great ammo, awesome price. Very clean, no dings or dents, accurate and no funky powder smell. Remington spec from Mexico. This is my go to ammo when available. No failures in my DPMS Oracle. I used these to break in / sight in my new Vangard. Once zeroed I was getting 1 inch groups @ 100yds and 1.5 @ 150 yrds. My gun seems to like it so I feel no need to pay more for anything else.